A while back I spent a week playing with the different patterns that floats can give you, but one I didn’t tackle back then was honeycomb. Partly because this one really needs some extra shafts (you can do it with pick-up sticks, but the pattern changes often) and I was just looking at pick-up sticks. 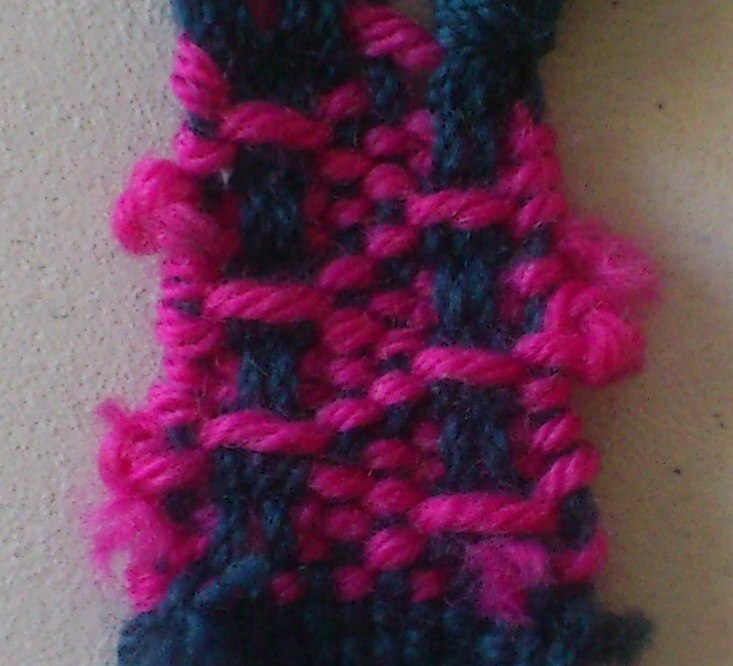 Any weaves that use floats to distort the cloth, work best if you use a heavier yarn to highlight the pattern. 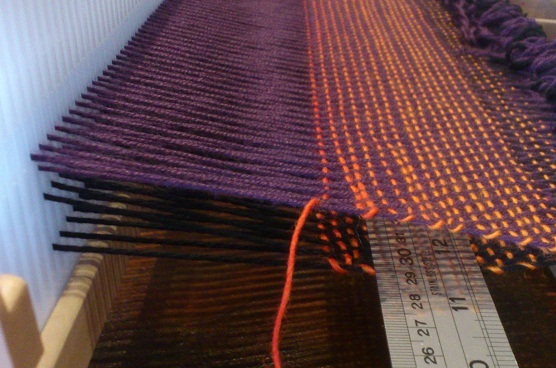 In honeycomb that means using a heavier weft (which I didn’t do) so that the “cells” have an outlined appearance. 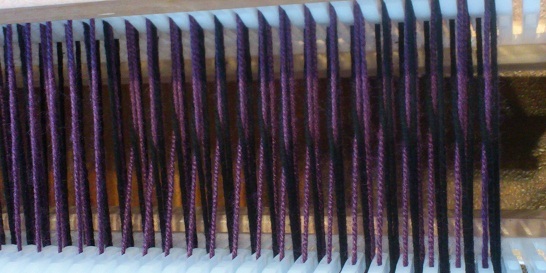 Here, when the floats shrink in the wash the tug the warp in different directions and pull the warp threads into shapes. 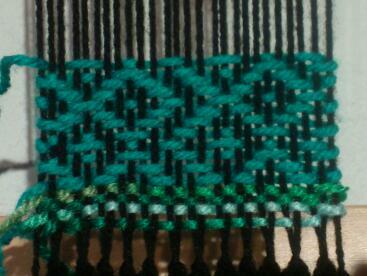 That is another thing to note about these woven patterns; they don’t show until you take the cloth off the loom and increase in strength after washing. So don’t panic if they look uninspiring while under tension on the loom! 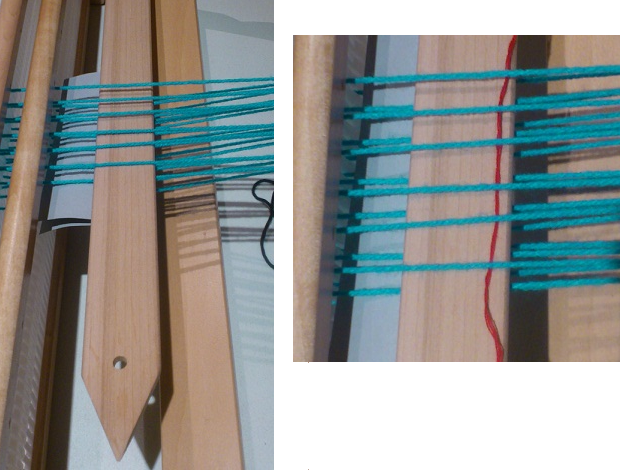 Having decided to give that 4 shaft pattern a go, I had to make string heddles to lift my slot threads. What are string heddles? They are a ‘stick’ onto which you attach loops of ‘string’ so that when you lift the stick, you lift a set of threads. 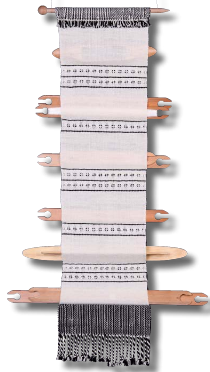 Commonly used with rigid heddle looms, but also for some techniques on multi-shaft looms. 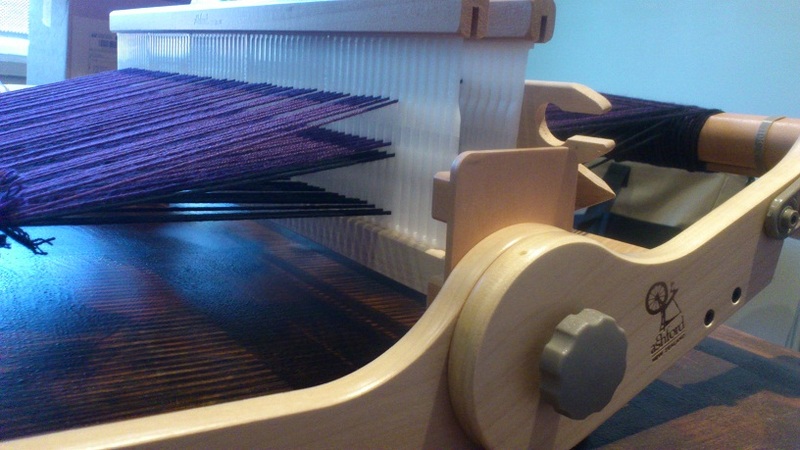 Once your loom is dressed, put both rigid heddles in the down position to get your hole threads out of the way. I slip a bit of paper into the ‘shed’ behind the heddles so I can see my slot threads clearly. Use a pick-up stick to select the slot threads for that shaft of the pattern. 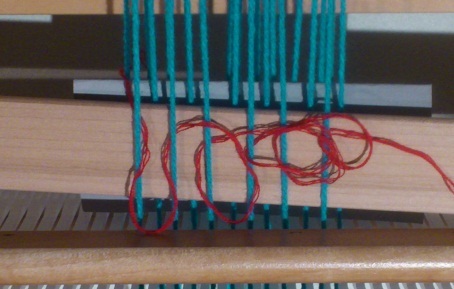 Pass your ‘string’ (thread, yarn, string…) under the selected threads – here I used some red yarn. 4. Use a hook to pull loops of your string between each selected slot thread and this will tell you if you’re string is long enough. 5. Slip the loops onto your stick (dowel, knitting needle, shuttle, pick-up stick…) and secure each end of the string to the stick with a tight knot – I’ve used a crochet hook as my stick. 6. Use some tape along the top of the stick to stop the string slipping off and you can also remove the pick-up stick at this point. 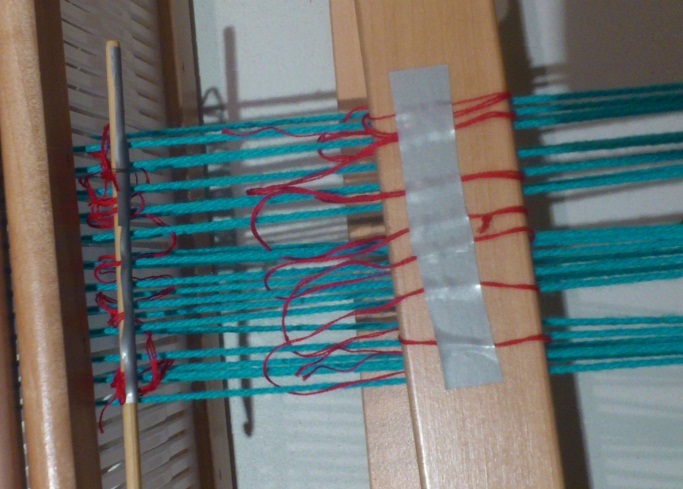 Repeat steps for second string heddle – here I’ve used a crochet hook and a shuttle as my ‘sticks’ as I was only weaving a narrow sample. 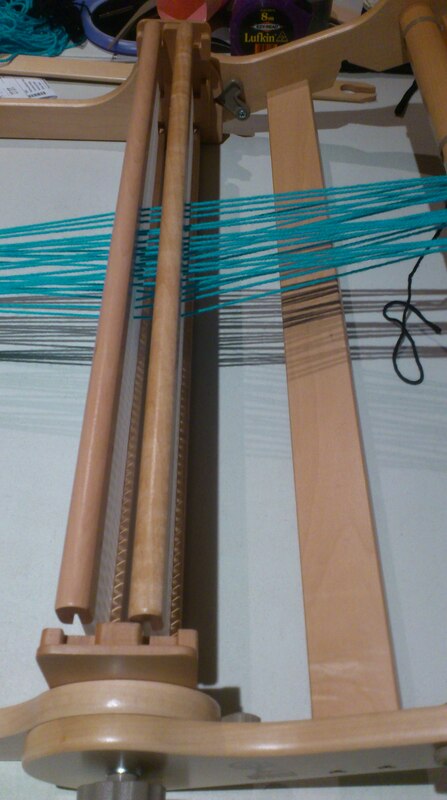 To get the best shed when you lift a string heddle, it’s good to hold the middle of the stick. 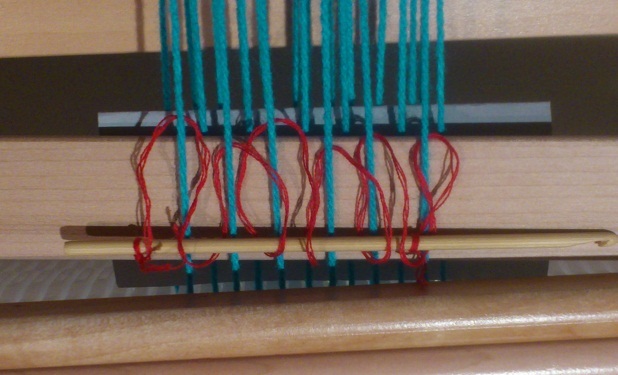 Also, have the loops of your string heddles as close to the rigid heddle as possible.